Idle is around 31W and maximum power consumption hits just under 99W in our test bed. Although the increase in TDP does not translate directly to increased power consumption, the Intel Xeon E-2134 we can recommend for extremely power constrained environments like 1A in 110V or 120V rack deployments. For the low-cost colocation world, this is a viable option. Note these results were taken using a 208V Schneider Electric / APC PDU at 17.7C and 72% RH. Our testing window shown here had a +/- 0.3C and +/- 2% RH variance. We double-checked on our 120V racks and were able to get power consumption over that common 1A threshold. Comparing generation on generation, the Intel Xeon E-2134 is a major improvement over the Intel Xeon E3-1230 V6. 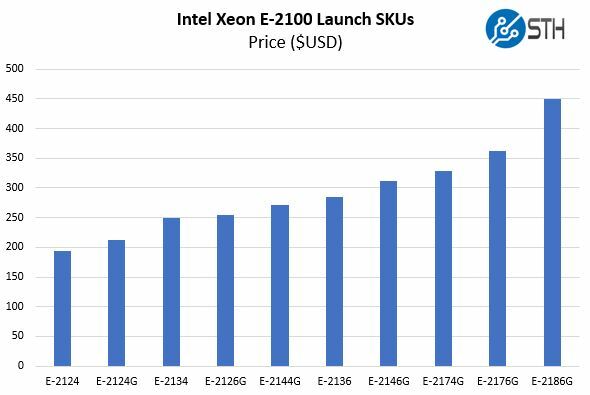 Hands down, if you are buying or leasing a server you will want the new Intel Xeon E-2100 series over the Xeon E3-1200 V6 series at the same cost. You can read about how the lines evolved in our piece Looking back at Intel Xeon E3-1200 V1-V6 to the New Xeon E-2100. That will show some of the incremental improvmeent strategy Intel has deployed for almost a decade and continues (in the quad core arena) with the Xeon E-2134. Compared to the Intel Atom C3000 series, the Intel Xeon E-2134 does not have all of the same platform features but is much faster in single-threaded workloads. The larger and more robust compute cores (as seen in our GROMACS test for example), and higher frequencies make this an option for low-cost low power 1U servers. The biggest competition is perhaps from the Intel Xeon E-2100 line itself. Here is a view of what the line looks like strictly comparing list prices. 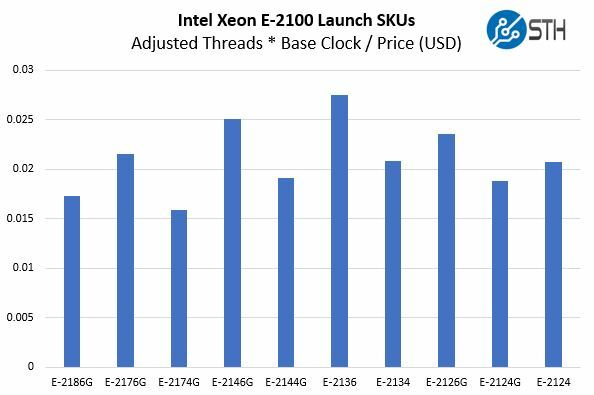 Here is another chart to guide the discussion regarding value assiming that the Intel Xeon E-2100 series hyper-threads are worth about 30% more performance than a physical core thread. Here the Intel Xeon E-2134 is a fairly average value part. It is the best of the four core/ eight thread parts. At the same time, the Intel Xeon E-2136 provides significantly more compute resources at a low incremental cost making it a better value. Our benchmark data backs this conclusion, especially with the minor delta. A $35 incremental cost for two extra cores is less than a 6% of the cost on a $600 cost-sensitive Xeon E-2100 server. This is a case where the only way we can recommend the Intel Xeon E-2134 over the Xeon E-2136 is if you have an extremely tight budget and no way to capture value from a 50% core count increase. Our advice to readers deciding between the Intel Xeon E-2134 and the Xeon E-2136: capture the additional value that the Intel Xeon E-2136 offers and let non-STH readers buy the Xeon E-2134 CPUs. 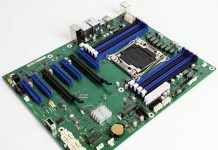 We are seeing the Tyan board move through manufacturing, but there is a difference between having one or two motherboards available, and having full range options available from Dell EMC, HPE, Lenovo, Supermicro, and others. If you utilized the Intel Xeon E3-1200 V6 generation platforms, the Intel Xeon E-2134 is a performance upgrade over the Intel Xeon E-1230 V6 at a similar price point. If you are looking for generational quad-core performance, this is a worthy successor. The reason we have difficulty recommending the Intel Xeon E-2134 is that the Intel Xeon E-2136 is a much better value. If you are a dedicated web host, selecting the Intel Xeon E-2134 may seem like a good way to save $35 per server or around 5-6%. On the other hand, your competitor that deploys the Intel Xeon E-2136 instead will get to tout what can be, in some cases, around 45% more performance in their systems at a nominal incremental cost. Lacking an iGPU is a feature we understand with the Intel Xeon E-2134, however, one can upgrade to the $22 more expensive Xeon E-2144G and get an iGPU. For many servers, this is not worthwhile, but for many getting a “G” part is worth a minor incremental cost.